Asparagus season is over now, but we had our best year ever. 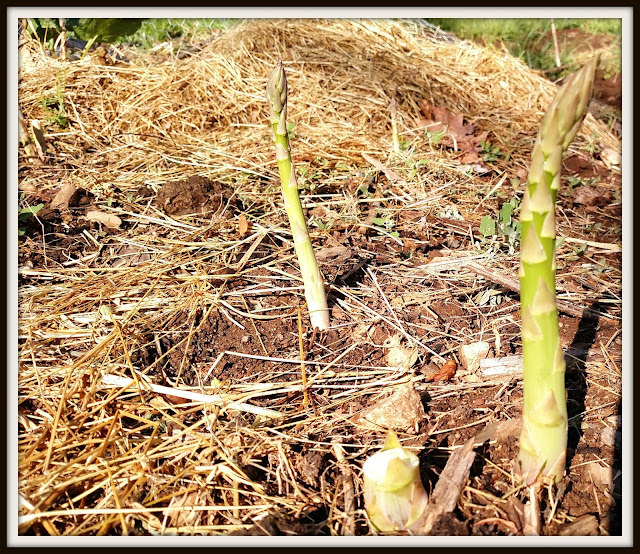 I think it's been about five years since I planted the asparagus bed. This year for a few weeks straight I had to pick asparagus daily. And the flavor! It had such a sweet flavor this year. I kind of wish asparagus wasn't so fleeting. It would be nice to be able to eat it year round. Readers, how do you like to fix asparagus? Over? It hasn't started here! Ya ours is slowing down too. I think two years ago was our best year but with the wife's surgery last year the beds kinda got over grown. I like to saute it in butter, but make a puree in chicken stock and add some shrimp for a good soup. I only know how to eat and enjoy asparagus . . . I like it grilled so that it doesn't get too mushy. How awesome to have fresh asparagus. I like it sauteed or I also like to bake it in the oven with olive oil and parmesan. I open the can and just eat it. Cold. Always have liked the stuff but wouldn't have a clue how to cook it. Saute it in butter, then add soy sauce. My Dad had an asparagus bed, I'm dreaming of having one someday. It is so yummy. I like it steamed with lots of butter. One of my favorite veggies ever; never thought to try and grow it myself. I sprinkle some olive oil and a dash of lemon pepper; roast it for about 13 minutes. Delish! Saute' with butter and a little seasoning of one sort or another. I'm not a fan of it but I haven't tried any fresh from the garden. i am jealous as I love home gardened asparagus. Looks yummy! Hope you got plenty to freeze for the winter too! We normally pick ours until the end of May, but we stopped harvesting a little earlier this year to avoid stressing the plants. Asparagus is the first veggie of the year here and it is amazingly delicious. I look forward to it every year! I eat it raw right in the garden, but also love it broiled with some olive oil and a little salt. If you want to put some up for winter we've found the best way to do that (other than pickling it) is to blanch and freeze it (with the tips kept separate) and make it into soup. Super delicious! We tried, but it never took off much here. I remember when we planted it my dad said, "It will go everywhere!" But it never really did. Maybe we'll have to try again. I'll try putting down better soil. I like ours roasted with lemon on it. We think they are good stir fried with garlic! I love baking asparagus with just a little salt and garlic powder. Yum! I never grew them before, so I was surprised to see how they pop up in the garden like that; so cool!